A lot has changed since my last Day in the Life post. 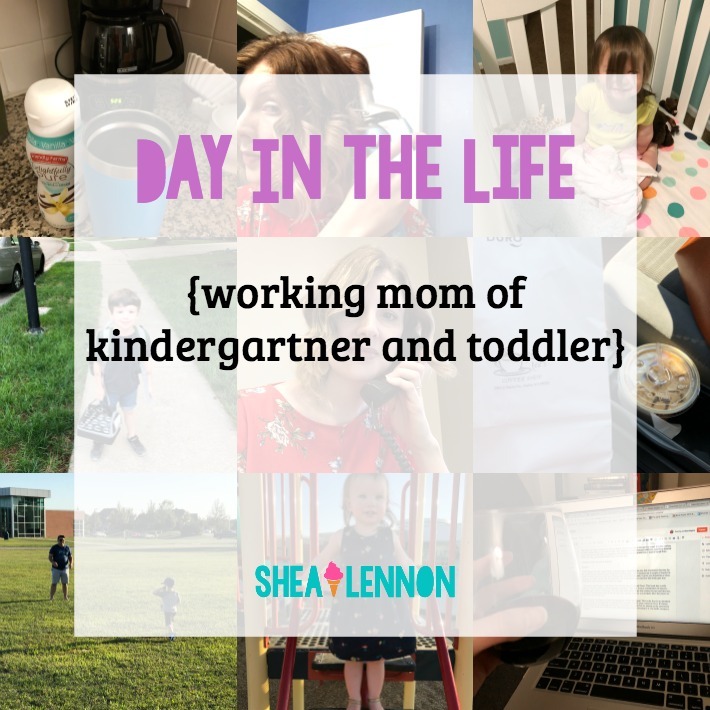 I have a new job (although it's with the same company, in the same office), I now work from home only one day a week, and I now have a kindergartner on my hands! Here's a little glimpse into my busy but happy life. 5:00 a.m. - Wake up! I am an early riser and love this quiet time of day when I'm the only one up. 5:10 a.m. - Meditate. I recently started this practice and try to meditate for around 5 minutes every morning. I use the Insight Timer app. 5:25 a.m. - Coffee. I get this going before I meditate so it's ready to go after that. 5:30 a.m. - Get ready. I listen to podcasts as I get dressed and ready for the day. 6:00 a.m. - Quiet time and breakfast. I spend a little time every morning reading scripture and having some quiet time with breakfast. On this day I had Power Muffins that Jona and I made over the weekend. 6:30 a.m. - Get Jona up. I give him five minutes and then make sure he's up by 6:35. This is not always easy. 6:38 a.m. - Breakfast for Jona. Today breakfast was an easy choice since we had the muffins, which he loves. Other typical breakfast picks for him are a peanut butter graham cracker "sandwich" or honey nut cheerios. 6:40 a.m. - Get Violet up. I try to get her up by 6:45, but this day she had been awake since 6:20 so I got her up right after I gave Jona his breakfast. 6:45 a.m. - Violet gets ready. I get Violet dressed, fix her hair, and brush her teeth while Jona finishes breakfast. Once he's done he gets dressed too. 6:55 a.m. - Jona tooth-brushing. I mentioned on Instagram Stories that we've been loving the podcast Chompers, a tooth-brushing podcast, lately. It tells little stories or facts and also guides kids on where to brush, when to change sides, etc. for two minutes. It is genius and Jona loves it! 7:05 a.m. - Load up and go. I load up the car with all our stuff and the kids, so that we can leave by 7:10. To get everywhere on time we have to be a well-oiled machine! 7:25 a.m. - Drop off Violet. Jona likes to come in with me to say hi to the family and the other kiddo already there. There are only three kids at her daycare, and she is the oldest. She loves being the little helper! 7:35 a.m. - Audiobook time. It takes at least 20 minutes to get to Jona's school from Violet's daycare, so we've been spending our commute with an audiobook. Lately we've been hooked on Hank the Cowdog--the audio is hilarious and Jona loves it. Before that came in we were listening to the kids podcasts Wow in the World and Story Pirates. 7:55 a.m. - Walk to school. Jona has struggled a bit with morning drop off, so to ease his anxiety (and mine!) I started parking on a side street and walking him in instead of waiting in the car drop-off line. Otherwise Jona is loving school--it just takes him a minute to settle in. 8:15 a.m. - Get to work. I start my day by getting caught up on emails and looking over my to-do list. 9: 25 a.m. - Writing. This morning I'm working on writing some health-related articles. My job is a Communications Specialist for a wellness company, so I do a lot of writing and design work. 10:00 a.m. - Walking break. I try to take a break once a day and get outside and walk (if the weather permits). This day was HOT, so I took my walk in the morning. 10:30 a.m. - Conference call. The people on my team are all based out of our other location in Rhode Island, so I talk to them on the phone or Skype regularly so I stay in the loop. 11:45 a.m. - Lunch break and reading time. One thing that hasn't changed with this new job and routine is my lunch break spent reading. It's one of my favorite times of the day. Today's lunch was leftover turkey chili, and the book was The Ragged Edge of Night by Olivia Hawker. 12:30 p.m. - Back to work. I had some design work for a client to work on. 1:30 p.m. - Iced coffee and treat. There's a local coffee shop right near my office, and about once a week I allow myself a little treat. Since it was hot that day, I got an iced coffee and a "goodness bar" which is a chocolaty, peanut buttery treat they make that's both vegan and gluten free. I'm neither one of those things, but I don't care, it's delicious. 2:30 p.m. - More work. I mostly took photos of the "non-work" parts of my day, because there are only so many interesting shots of a computer. But another part of my job involves proof reading other people's designs and writing, and I did a little of that in the afternoon. 5:00 p.m. Goodbye work. Aaron picks up both kids from school/daycare, so I have a quick trip home once I'm done working. 5:30 p.m. - Dinner. On Wednesdays Jona has tee ball practice at 6:00, so we eat a quick dinner of leftovers or sandwiches. Usually the kids are already eating by the time I get home. For me it was a leftover sub sandwich from Mr. Goodcents and some spicy pretzels Aaron made over the weekend. For the kids it was peanut butter sandwiches (or peeda budda as Violet says). 6:05 p.m. - Tee ball. Jona plays catch with Aaron to warm up while they wait for the field to be ready. There were some older kids finishing up so we had to wait. 6:20 p.m. - Playground. The practice is held at an elementary school, so Violet plays on the playground while Jona and his team practice. She loves it! 7:20 p.m. School day prep. I check Jona's kindergarten folder and take out any papers to keep and make sure there's nothing to send back. I also prepare his snack and lunch for the next day, which I usually try to do during dinner prep but doesn't always happen on tee ball nights. 7:30 p.m. - Bedtime for Violet. We read one or two stories, depending on her crankiness-level. She doesn't really liked to be rocked anymore, so usually I just hold her for a minute or two after turning the sound machine on and the lights off. Sometimes we sing a song. She sleeps with a blanket and about a million stuffed animals in her crib. Meanwhile Aaron puts Jona to bed (we alternate kid bedtimes). 8:00 p.m. - Evening tasks. I take a shower, then listen to an audiobook as I do various evening tasks around the house. At the time I was listening to I Am, I Am, I Am, a memoir by Maggie O'Farrell. 8:30 p.m. - Blog and wine. By this point I've poured myself a glass of wine (red because it's fall now, hooray! ), and I work on my blog post for the next day. 9:20 p.m. - Next day planning. I always write down what I need to do the next day, and also see if there's anything I need to remember to bring or do. I'm fiercely devoted to my planner and could remember nothing without it! 9:40 p.m. - Read and bed. Ahhh, bedtime. I always read before I go to sleep, and on that day I was reading Daily Rituals: How Artists Work. I try to go to sleep by 10 every night, although that doesn't always happen.